We all know mold as that substance you don’t want to see in your home, but mold is also known to cause health problems. Symptoms can be as minor as itchy eyes or a stuffy nose, but in worse cases, mold can cause breathing and respiratory issues. Mold is a hard to kill fungus which allows a superficial growth to live on damp and/or decaying matter. Even when in dry forms, mold often finds itself traveling through the air in your home. Mold usually is found in cool, poorly ventilated areas like basements and attics, but even in hot temperatures, mold is known to be found. Mold is usually attached to paper, wood, tile and cement and usually appears black in color but can be found in other colors especially white or green. Mold usually appears with a velvety consistency. The first step in taking care of your mold problem is by using our MMR mold stain remover, the most rapid mold remover on the market. MMR mold stain remover is a biodegradable and nonflammable formula that removes mold and mold stains quickly and easily. Bleach is commonly used as an alternative, but while bleach is used for hard solid surfaces like tile, MMR is best for wood and porous/semi-porous services. After you get rid of the mold stain , the next step is disinfecting the surface and then preventing mold from appearing again. We have products for that, too. One of our signature products is Shockwave. 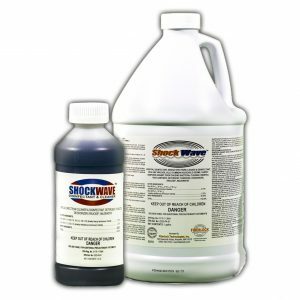 Shockwave is quaternary ammonium chloride cleaner, disinfectant, and sanitizer - registered by the EPA. Shockwave is to be used on various surfaces subject to microbial contamination. As mentioned before, Shockwave is used after applying MMR mold stain remover. Shockwave is made to get into those hard-solid surfaces but also works great when used on porous and semi-porous surfaces. Shockwave is also of use when treating wood structural members, carpets and other porous and nonporous surfaces during a complete mold remediation project. Shockwave is to be diluted two ounces per gallon of water used, meaning you get 5 gallons of use per 10 ounce bottle. This makes Shockwave your economical solution when cleaning, disinfecting and sanitizing. Shockwave is available in a 10 oz bottle for $17.75, or a 1 gallon jug for $39.00. One 10 ounce bottle of Shockwave is recommended for every 5 gallons of MMR mold stain remover you use. When combined in conjunction with MPI antimicrobial, the application of Shockwave and MMR mold stain remover will provide a rapid mold remover result with long-lasting mold prevention.